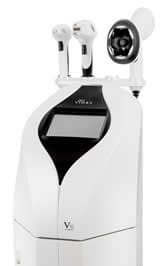 V10 Multi RF Will Transform Your Clinic! Want more information on how V10 can help you? Contact us today! V10 is a flexible and scalable solution that lets you easily grow your business, at your convenience. Expand your treatment menu and increase your ROI by adding interchangeable handpieces when you need them. Get the largest treatment area for the fastest contouring and cellulite treatments, with ABS for safe and comfortable procedures. Use Viora’s innovative handpiece to address wrinkles and lax skin. Go beyond fractional results for the most effective, minimally invasive treatments for rejuvenation and resurfacing. (Channeling Optimized RF Energy) – groundbreaking multi-frequency, bi-polar technology for contouring and tightening. (Switching, Vacuum, Cooling) – second generation fractional RF technology for rejuvenation and resurfacing.